Please see below for dates and census information. Information collected through family documents has been courtesy of Sharon Strange. Thomas Gray, (1804-1858), a carpenter and wheelwright, married Mary Ann Coventry (1808-1865) on the 29 November 1831 at Chalgrove in Oxfordshire. They had seven children, of which three came to live in East Oxford in the mid-nineteenth century. The three children were Matthew (b 1834), Thomas (b 1839) and Abednego (b 1845) who were carpenters and builders. Rural migration was common during this time as the cities offered more employment opportunities. This was particularly so in the developing East Oxford suburb. 1. Matthew Gray, a carpenter, according to the 1861 census lived in Bath Street, Cowley. He later moved to Pembroke Street (now Rectory Road). At this time Mathew was married to Harriet Quartermain and there were two children, William born on 8 March 1859, and Harriet born in 1861. The 1871 census lists more children Walter (10), Joseph (8), Charles (6), George (4), Albert (2), and John (1). The family built up a successful building business from Rectory Road. Building workers were needed in the developing area. By 1881 Mathew Gray had moved to 200C Cowley Road. He was a widower aged 46 years and his daughter Harriet was listed as his housekeeper. William (22), Joseph (18) and Charles (16) were carpenters. Albert (11) Agnes (8) and Alice (4) were the younger children in the household. In 1903 William Gray then a relatively successful business man stood as a progressive candidate for East Ward and was duly elected. He went on to be chosen as Sheriff of Oxford and elected Mayor in November 1910. 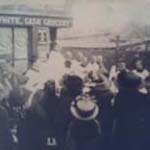 When he died in 1931, large crowds lined the funeral route from St Clement’s Church to Rose Hill cemetery. 2. Thomas Gray senior (1839-1889) also worked as a carpenter. On 25 March 1860 he married Charlotte Walton in Banbury. In 1861 aged 21 years (given as 24 years on the census) he lived at Bath Street, Cowley. The family lived in various homes in east Oxford including Princes Street, Robin Hood Terrace and 99 Catherine Street. By 1881 the couple were living at 1 Catherine Street with their nine children, Emma Gray (21), Thomas (17) Carpenter, Esther Ann Gray (16), Mary A Gray (14), Harriet Gray (12), Ernest G Gray (10), Frank Gray (8) Benjamin Gray (6) and Joseph Gray (4). Thomas Gray senior ran his carman’s business from No 1 Catherine Street. There were stables out the back for the horses and carts. Descendants of Thomas Gray report that Thomas was also a builder who built No.1 Catherine Street and a cottage named Tysoe Cottage (his wife Charlotte was born in Tysoe, Warwicks.) Relatives also owned No 17 Catherine Street and ‘a few others’ in the street. Thomas Gray senior died of bronchitis in 1889 aged 49. 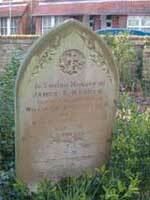 He is buried in Ss Mary & John churchyard with his wife Charlotte in D241. Thomas’ will left his Carman business to his wife, to be managed by his sons Frank and Joseph who would inherit the property at No.1 following Charlotte’s death. Meanwhile, Charlotte was to receive “monies and interest arising from my Freehold property and land situated in Katherine Street Donnington Road Maudlen (sic) Road”. The eldest son Thomas Gray junior inherited the building portion of his father’s business as his trade was also carpentry. He was instructed to complete the works in hand in Magdalen Road and to build on two plots of land in Katherine Street adjoining Tysoe Cottage. In 1891 Thomas Gray junior and his family were living at 110 Magdalen Road (possibly ‘the works’ referred to). After Frank’s death in 1912 Joseph continued with the carman’s business, gradually transferring from horses to lorries. Relatives remember seeing their lorries about town so the business was still going until at least the 1950s. Several of Thomas Gray senior’s children are buried in the churchyard in the same grave B35: Esther Ann Gray (married name Archebutt) who died on 10 March 1927 aged 61 (she was living in Pimlico SW1 in London at the time and either brought back to be buried at Ss Mary and John or died suddenly whilst visiting the area); Frank who died in 1912 aged 39; Benjamin who died in 1901 aged 21yrs. Mary Ann Gray, one of Thomas Gray senior’s daughters, married William Charles Simmonds who as a youngster lived at 121 Cowley Road. When they married, Mary and William lived at 117 Magdalen Road. Three of their young children died in 1890, 1892 and 1901. Mary Ann died on 28 Oct 1926 aged 59 and William died on 23 April 1931 aged 67. 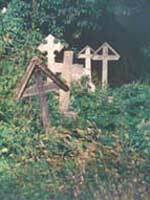 They are buried in Ss Mary & John Churchyard (C10). Harriet Gray, another daughter, married Francis Evans who in 1881 lived at 126 Bullingdon Road with his family. Harriet died in 1929 as did Francis and they are both buried in the graveyard (B49). The early death of Thomas junior, the major bread winner, meant that the family went from a comfortable (within working class terms) position into ‘living hand to mouth.’ There was no welfare state to support the family. His youngest child (out of nine) was 12 years old at the time of his death. Emily Gray married Alfred Berry a boilermaker, (1873-1924) on 30 July 1898 at Cheltenham. Their first child was born in Cheltenham in 1899, but in 1901 they were living in Grimsbury near Banbury. The birth of their third child Aubrey was registered in Headington district (which incorporates Cowley) in 1903 and the family lived at 13 Barnet Street. Emily had to take in washing to make ends meet, despite not having a water source in the house. Emily Berry died in 1939. The Grays appear to have been doing well in their businesses but the menfolk seemed to have died prematurely (except Joseph and Ernest). Thomas senior aged 49 from bronchitis, Benjamin aged 26, Frank aged 39 and Thomas junior aged 33. Although two of Thomas junior’s children died, those that survived into adulthood, despite being poorer, lived much longer than their uncles. 3. Abednego Gray, the youngest of the three brothers who migrated into Oxford, was born in 1845 at Great Milton. By 1861 Abednego was working as a 16 year old apprentice carpenter living in the centre of the village of Waterstock with his widowed mother and his younger brother Joseph, a servant. The family appear to have been primarily supported by an older sister Ann, a school mistress. Abednego married Emily Oliver (born about 1842 in Great Milton) in 1864. He continued to follow the primary family occupation of carpentry, and also settled in East Oxford. In 1871 they were living at 19 James Street. By 1881 they had moved to 66 James Street. He too died at a young age, 40 years old in 1885, just after the birth of his 10th child. He is buried in the churchyard: D138. Abednego’s widow was still living at 66 James Street in1891. Lucy Clementine GRAY (born 1892) is the bride. Seated 2nd left is Ellen Harriet GRAY, 4th left is her mother Emily GRAY. Maud Beatrice GRAY is in the back row, 2nd left. Probably the eldest sister, named Emily Henrietta after her mother, and her husband are 4th and 5th left on the back row.